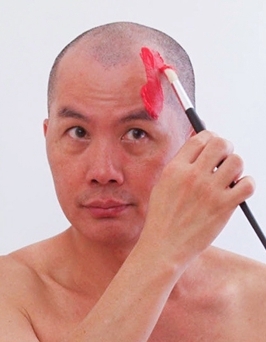 As a Chinese-Indonesian immigrant living in Sydney, Australia, my practice blends eastern and western mythologies with the reality of current events. By cross-referencing a stereotypical understanding of a displaced person with an autobiographic experience, I am able to interrogate themes of racism, poverty, corruption and social injustice. My work is visual storytelling. In it I re-animated my experiences through vibrant and reflective ceramic sculptures that are reminiscent of offerings prepared by my mother to the universe during my childhood. With an emphasis on colour my works deliver a personal expression of identity and diversity culminating in a celebration of liberation and creative freedom that is alert to a traditional and contemporary Chinese-Indonesian Australian identity. The exhibition is offered in conjunction with my previous residency in Indonesia that leads to my recent works. I also visited my birthplace in North Sumatra, after an absence of 35 years. The resulting symbolic ceramic sculptural objects are reminiscent of the offerings made by ordinary everyday Indonesians and Chinese-Indonesians. Intertwined with western mythology, the works offer a sentiment of mixed spirituality and sharing. 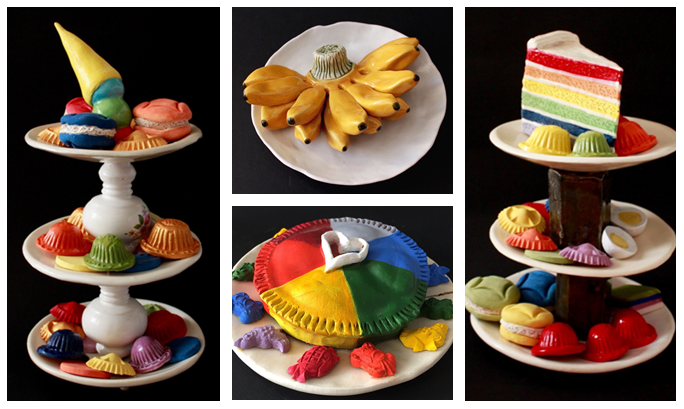 These cakes, like objects, are presented as a single harvest demonstrating the mixing of diverse culture and harmonies. They are playful but insistent in their presentation of the cornucopia that our culture has become. Limited seats. RSVP Essential. Please RSVP HERE (opens in a new window) before 2 May, 2018. Tan has exhibited extensively in group exhibitions at the following galleries; National Art School Gallery, Annandale Creative Art Centre, Kerrie Lowe Gallery, Gaffa Gallery, Accelerator Gallery, Muse Gallery, The Old Fire Shed Gallery at Wollombi Valley Cultural Centre.He has also been in international exhibitions at BG Studio Red Gate, Beijing, China and Place Suisse des Arts, Lausanne, Switzerland. Tan has been a finalist in numerous national art prizes within Australia, including; HIDDEN, Rookwood Sculpture Walk, Sydney; Bayside Sculpture Award, Kyeemagh; Harbour Sculpture Prize, Woolwich; North Sydney Art Prize; Fisher’s Ghost Prize, Campbelltown Art Centre; National Pottery Competition, Hazelhurst Gallery; Sculpture at Scenic World, Blue Mountains and Sculpture in the Vineyards, Wollombi Valley. Tan had a recent solo exhibition, “Heritage – Peranakun”, at Chrissie Cotter Gallery, Sydney and he also participated in artist residencies at Tantery Pottery, Bali, Indonesia, in 2017 and Red Gate Gallery, Beijing, China, in 2013.